Tea is a daily practice for us, and we're thrilled to bring this new offering to you. We'll guide you and your guests through a quiet, intimate ceremony to mark your occasion or host a casual tea sitting where you and guests can sip tea and connect with one another during your event. Tea is served by Erica Ekrem who has been studying The Way of Tea since 2007. She offers two forms of ceremony: ChaDao (Daoist form of pouring loose-leaf tea) and Forest Tea ( Japanese form of serving whisked matcha). 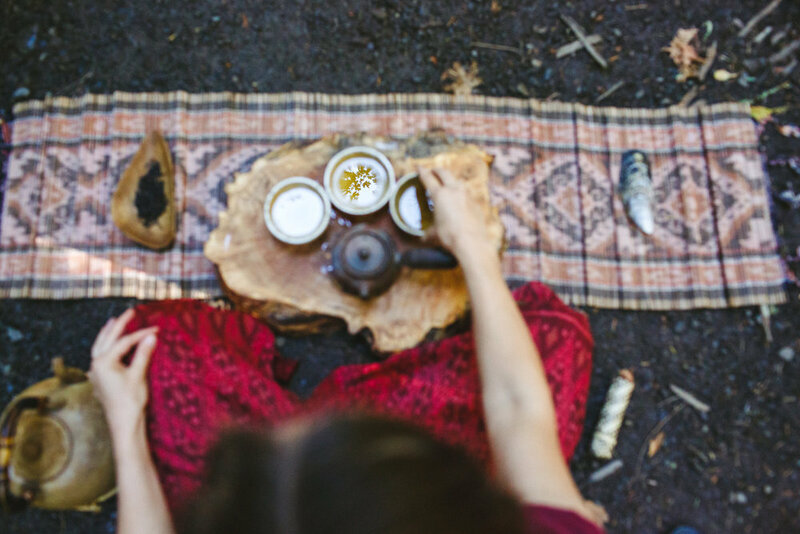 Erica has shared tea with community in the deep of the forest, on a secluded island, in church, in a barn, and on the top of mountains. No matter the place, the intention is to sit, to sip, to listen to the quiet that longs to be heard and to serve as refuge for Stillness in a world that is so quick to move. The sharing of tea is a beautiful way to ground and connect with your community. It is an opportunity to slow down, breathe, and to fully meet the moment at hand. The ceremony can be adapted to serve weddings, life transitions, family reunions, retreats, and any type of small-medium gatherings. Thank you! Erica will get back to you within 1-3 business days.